Welcome to our new postdoc, Kelley Erickson! 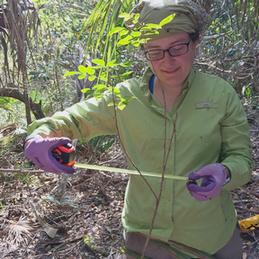 We are excited to serve as the new intellectual home of Kelley Erickson, a recent graduate of the University of Miami where she studied the demography of the highly invasive shrub Schinus terebinthifolia (Brazilian peppertree). Kelley is working on incorporating issues related to detectability in species distribution models in a project sponsored by the Institute for Museum and Library Services. Welcome, Kelley!